The United Nations Environment Programme published new figures Thursday which showed global renewable energy capacity additions in 2016 reached record levels, with 138.5 gigawatts (excluding large-hydro) deployed, despite global investment figures falling 23%, which was in line with sector-wide cost declines. 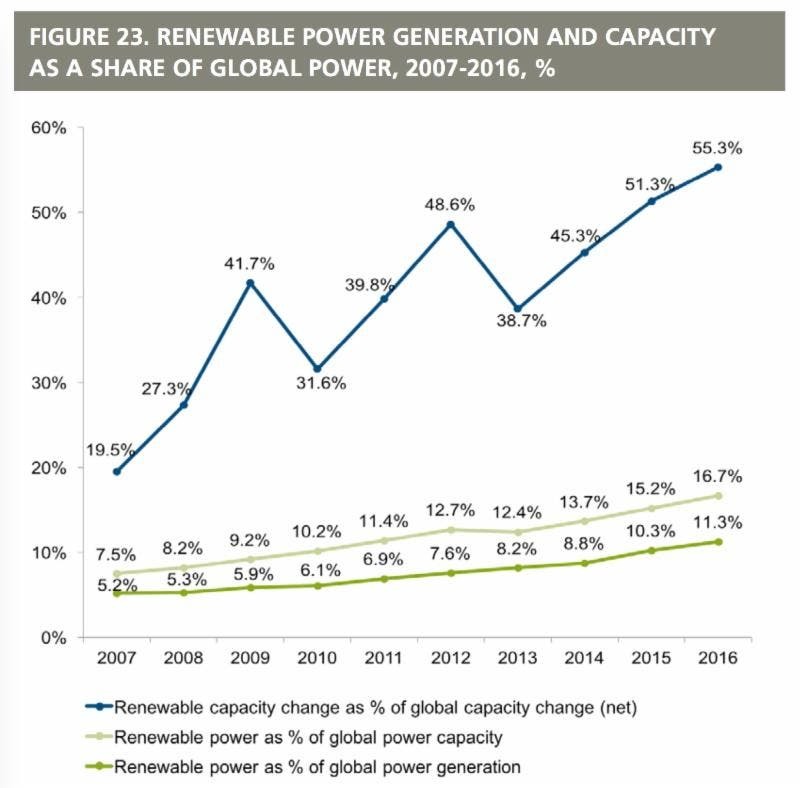 Specifically, according to the United Nations Environment Programme (UNEP), global investment in renewable energy for 2016 came in at $241.6 billion, 23% less than in 2015, but nevertheless helped to deploy 138.5 gigawatts (GW) of new renewable energy capacity (excluding large-hydro), a figure up 8% from the 127.5 GW installed in 2015. The new report UNEP report, Global Trends in Renewable Energy Investment 2017, found that the total investment level was the lowest it has been since 2013, due in large part to falling costs, rather than a drop in demand. In fact, the average dollar capital expenditure per megawatt for solar PV and wind dropped by 10% in 2016, even as solar had a record year of 71 GW, according to figures published by the International Renewable Energy Agency (IRENA) last month, ahead of new wind capacity with 51 GW (though this was down from a high of 63 GW in 2015). 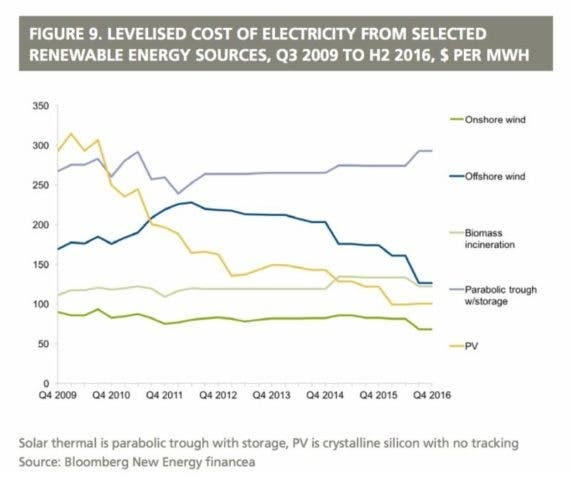 Considering that new investment in solar dropped 34% in 2016, down to only $113.7 billion, and wind investment accounted for $112.5 billion, down 9%, this is good news for the renewable energy industry, which seems to be getting more bang for its buck. “The investor hunger for existing wind and solar farms is a strong signal for the world to move to renewables,” said Prof. Dr. Udo Steffens, President of Frankfurt School of Finance & Management. Unfortunately, this growing “bang for your buck” is not a worldwide trend, and more investment is still needed to help developing economies grow their own renewable energy capacity. Renewable energy investment in developing countries fell by 30% to only $117 in 2016, while that in developed economies fell 14% to $125 billion. Breaking an astonishing 11-year rising trend, China’s renewable energy investment fell by 32% to only $78.3 billion, while countries such as Mexico, Chile, Uruguay, South Africa, and Morocco all saw investment decreases of 60% or more due to slower than expected growth in electricity demand and delays to auctions and finances. There were a few exceptions, however. Europe saw renewable energy investment increase by 3% to $59.8 billion, led by the UK with $24 billion and Germany with $13.2 billion. Unsurprisingly, given recent trends, offshore wind dominated Europe’s investment, increasing by 53% to $24.9 billion, thanks in part to huge projects such as the 1.2 GW Hornsea project.